This indulgent maple crepe cake is layered with maple buttercream frosting, homemade maple pecan pralines, and covered with a maple white chocolate ganache glaze. It makes a show stopping dessert that is sure to impress any maple syrup lover. When I was about seven years old, my best friend at the time moved about a few hours away from where we grew up. You can imagine how devastating it was to both of us since we were like two peas in a pod — and like any other kids our age, we made a pact to keep in touch no matter what. During summer vacation that year, her family even invited me to stay over for the night. We had the best time that day and played, chatted and finally zonked out way past our bedtime. We probably would have slept until noon the next day if it wasn’t for the MOST amazing smell coming from the kitchen. My friend’s mom was making pancakes for us in the morning and even though she’s made them for us in the past, there was just something so very special about this batch. Since it was such a happy reunion for us, she said she added tons of extra love plus a touch of maple syrup to the batter. Well, I can’t say that I remember how many pancakes I had that morning but I do know that they were the best tasting pancakes I had ever had. Sadly, we did end up losing touch over the years since both of our families ended up moving away even further. So you can imagine how delighted I was when PURE Infused sent over 5 bottles of their maple syrup for me to try in order to share a recipe since it immediately brought back such wonderful memories. I decided to use the Lavender and Chai Maple Syrup since I am a fan of both flavors. It’s a beautiful combination with a touch of floral and a little spice which worked beautifully for the special breakfast dish that I had in mind. Instead of pancakes, I decided to make crepes for a crepe cake which has been on my baking bucket list for the longest time so I’m glad I finally took the plunge. If you’ve never made a crepe cake, I assure you, it’s really not too hard. It does HOWEVER take quite a bit of time to make all the layers and assemble them. The results are totally worth it though when you end up with an epic dessert waiting for you. I used a basic crepe recipe where each layer is filled with Maple Buttercream along with homemade Maple Pecan Pralines sprinkled in every other layer for a sweet crunchy goodness. Finally, a sea of rich Maple White Chocolate Ganache is poured on top with another splash of Maple Pecan Pralines and a dusting of powdered sugar. This crepe cake packs a whole lot of maple syrup in the batter, frosting, pralines and ganache making it an absolute maple lover’s dream. It makes an impressive dessert and will be perfect for a special brunch. And if you don’t feel like making a crepe cake, you can still enjoy all the maple syrup-y goodness and just make the crepes without stacking them. Just fill each one with some frosting along with the crunchy pecan pralines and pour on some of the incredibly addictive maple white chocolate ganache. This indulgent maple syrup crepe cake is layered with maple buttercream frosting, maple pecan pralines, and covered with maple white chocolate ganache. It makes a show-stopping dessert that is sure to impress any maple syrup lover. Place all crepe ingredients in a blender. Blend on high speed until completely smooth. Pour the batter into a large bowl with a cover to chill in the refrigerator for at least an hour or overnight. While the crepe batter chills, prepare the pralines: Line a sheet pan with parchment paper, set aside. Combine the cream, butter and maple syrup in a small saucepan. Stir until well mixed. Cook over medium heat, gently swishing the pan around every few minutes, but do not stir. Heat until mixture gets very thick, about 7-10 minutes. Remove saucepan from the heat and let the mixture stand for about a minute or two. Stir in pecans. Drop small spoonfuls of mixture onto parchment. Sprinkle with sea salt. Allow to cool until harden for a few hours or overnight. Chop or break into small pieces. Heat a lightly-greased small non-stick skillet over medium heat. Working in batches pour a scant 1/4 cup of batter into the pan and tilt with a circular motion so that the batter coats the pan evenly. Cook the crepe until the edges begin to turn lightly golden brown and lift away from the sides of the pan, about 1-2 minutes for the very first crepe (the rest of the crepes cook faster about 30 seconds to 1 minute). Flip the crepe and cook for an additional 30 seconds to 1 minute. Place the cooked crepe onto a plate and repeat until all the batter is gone, stacking the crepes on the plate. Place the cooked crepes into the refrigerator to cool for at least 1 hour. You can make the crepes a day before assembling the cake. Beat the softened butter and cream cheese together in a large bowl until light and fluffy. Add in the maple syrup and beat until well combined. Turn mixer to low and gradually add in the powdered sugar until well combined. Slowly add 1 tablespoon or less of heavy cream as needed to reach desired consistency. Add in more powdered sugar as needed. Beat the frosting on high speed until it is light and fluffy, about 5 minutes. Place into the refrigerator until ready to use. Place finely chopped chocolate in a small heatproof bowl. In a small saucepan over low heat, heat cream just to a simmer. Remove from heat and immediately pour the cream over the chopped chocolate and allow to stand for about 10 seconds. Stir the ganache until smooth. If all the white chocolate has not melted then place the bowl in the microwave and heat for 30 seconds. Using the same saucepan, melt butter over medium-low heat. Combine syrup and brown sugar. Bring to a boil over medium heat and allow to thicken for 1-2 minutes. Pour into the white chocolate mixture and whisk until smooth. Allow the ganache to cool until it reaches the desired consistency. Place one crepe down on a plate. Drop 1-1/2 - 2 tablespoons of the maple frosting on top. Use an off-set spatula to spread the frosting out over the whole crepe in a thin layer. Gently place another crepe on top. Drop another 2 tablespoons of the frosting and this time, sprinkle with 1-2 teaspoons of the chopped maple pecan pralines and place another crepe on top, gently pressing to adhere the crepes together. Repeat these steps until you get to the last crepe. Pour the maple ganache over the top of the cake and sprinkle with more of the maple pecan pralines. Refrigerate for an hour or overnight to allow the cake to set. Ganache can also be poured on the cold cake, before serving. Sprinkle with powdered sugar prior to serving if desired. Alternatively, if you do not want to stack the crepes for a cake, just fill each crepe evenly with the cream cheese frosting and a sprinkle of maple pecan pralines. Fold into quarters and serve with white chocolate ganache poured on top and another sprinkle of maple pecan pralines. Disclaimer: I received free product for testing from Pure Infused Maple Syrup for recipe development. All opinions are my own. Check out PURE Infused’s website for more information about their maple syrup. This crepe cake is just gorgeous, Kelly! I’ve never seen anything quite like this! I’m loving the maple and praline flavors. I’m sure this is the best pancake breakfast to sit down to! One word – WOWZA! That is a seriously amazing looking cake, Kelly! My mouth watered when I saw it. I’d love, love, love to have a slice – and that’s such a great memory you shared with your friend! This certainly is impressive, Kelly! Looks great, I bet it tastes even better! Kelly, I love stories like that! where you have a food memory that brings back something special. . this made me think of my daughter and the friendships she has formed and if we were to ever move away. . love love love this gorgeous crepe cake!!! I’ve always wanted to make one of these!!!! I need to soon! gorgeous! How funny…. I just posted crepes yesterday, along with a long story about how I made 2 crepe cakes and they both failed miserably. I don’t know what I am doing wrong, but you make it look and sound so easy! I think I must be cursed though. Haha!!! I used a basic crepe recipe and a cream cheese frosting, but when assembling, the frosting just melted and separated and became watery. It was so odd. I know it’s me, but I just don’t know what I’m doing wrong! Lol. This is definitely the BEST crepe cake I’ve seen – I adore maple and pecan desserts!!!! What a gorgeous crepe cake, Kelly! I still use the recipe from my best friend’s family to make crepes. I have yet to master the art of crepe cakes though! Such a beautiful cake! Those infused syrups sound great! Outstanding! Recipe and photos! Mmmmm, I wish I had a slice right now! And of course I loved your story….as sweet as your cake! Pinned! Wow, that’s an impressive dessert! Love all the maple flavour you managed to pack into it! Wow, your photos and cake are STUNNING! And um, lavender chai infused maple syrup sounds like the actual best thing ever. Such a sweet memory! I love that ever time you make pancakes you’re reminded of your friend. This crepe cake is amazing Kelly! This most surely is a showstopper, Kelly! It is all the better for the special memories it evokes. It’s such a sweet, touching story about your friend and I love how food ties it all together, as it often does. : ) I wish your friend could see this crepe cake she helped inspire. It is such a lovely project. Kudos to you for doing it and doing it so well! I love how food recalls such lovely memories like the ones you shared with your old friend 🙂 And this crepe cake looks fabulous–can’t go wrong with a stack of crepes! Wow, i love maple syrup pancakes and these crepes look so yummy! I love the maple pecan pralines too! What a great creation Kelly! Pinning! this is SO gorgeous! I bet it was absolutely heavenly! Oh my goodness…drroooollliinnngggggg. I need this now! Oh my word! Seriously?! This crepe cake is INCREDIBLE Kelly – I mean WOW. Absolutely gorgeous! Wow! This crepe cake looks positively decadent! I love that each layer is frosted with maple buttercream and the praline filling…so divine! Looks so beautiful too! Wow, just wow! This looks so incredibly delicious! I want it now! I have always wanted to make a crepe cake. This looks amazing! THIS LOOKS AMAZING!!! WOW! I’ve never made a crepe cake before but I’ve always wanted to, and now I’ve seen your beautiful recipe I know I’m going to have to make it! All of the ingredients sound so delicious, especially the maple white chocolate ganache – oh my!!! Aaw thanks Harriet! Hope you get to try making one. Hope you enjoy the rest of the weekend! I’m drooling over all of these photographs. I love maple everything, so this would be the perfect breakfast (or dessert) for me. This crepe cake is absolutely stunning! And your pictures are beyond marvelous. Maple pecan is just such a wonderful flavor, makes your taste buds just twirl. But I love all the layers in here and slicing this cake must be so much fun!! I’d actually love to serve this for a dessert more than breakfast because then more people would see it, ha. WOW Kelly! THIS is awesome! Such a great idea — pinning for sure! Thanks Ashley and for pinning 🙂 Hope you’re having a great weekend so far! That is a gorgeous looking crepe cake, Kelly! I love it so much! It is beautiful and I’d love to have a slice!! My best childhood friend moved away too and it was so sad! But she was only a few states away and I was able to visit her in the summer. Such sweet childhood memories. I always remember the food too and would love a big slice of these crepes! oh god Kelly STOP! You are making my mouth water right after I had my breakfast :/ This is seriously stunning, you did such a fabulous job with this crepe cake!!! What a sweet story!! Tons of love + maple syrup = a recipe for goodness!! Thanks for sharing this lovely recipe Kelly! It looks so beautiful and delicious! Double win! This cake is so gorgeous! I love all the layers. There’s nothing better than real maple syrup. Those ones sound so interesting– chipotle and lemongrass! Woah! I just “got” it!! I’ve seen giant crepe stacks before, I just never thought of them as cakes until now!! This is so clever, I love it. Pinning! 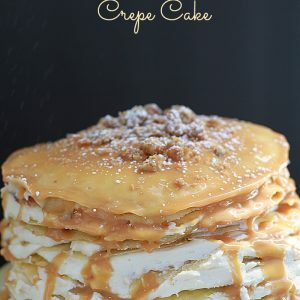 I think you know how much I love maple, so this crepe cake looks fantastic! You did such a great job on this, Kelly, love all those flavors! I have been dying to make a crepe cake and just haven’t got around to it but I can guarantee that when I do, I will be using your recipe! I love maple and pecan!!! I LOVE MAKING CREPE CAKE! Yours is SO gorgeous! I totally need to get my hands on these syrups, especially since they are from my home land! Pinned! What a beautiful cake Kelly! I love all of the layers. It makes such a nice presentation! Thanks so much Kelley! Hope you’re having a great weekend so far! OMG you should see my face. I am absolutely in love with this cake. I always wondered how to make a Crepe cake. And I can’t wait to try out your recipe. This looks amazing and will wow anyone. Amazing post. Good lawd!! That is all I am saying!! Haha, thanks Z 🙂 Hope you’re having a great weekend so far! Love this post Kelly! The cake is gorgeous and flavors are fantastic! Pinned of course! Love crepes! What an AMAZING looking crepe cake! I am so in love with this decadent cake! Simply AWESOMELICIOUS. Crepe cakes are also on my bucket list Kelly. I just hope that when I decide to finally cross that off the list mine comes out as beautifully as yours has. What a beautiful story about your childhood. Kelly I love love crepe cakes!! This is simply stunning!! This crepe cake is out of control, Kelly! So stunningly gorgeous and those maple syrups infused inside sound positively amazing! This looks so ridiculously good! I LOVE frosting (prob too much lol) and I’m totally going crazy for so many layers of it. OMG! I had a couple friends move away when I was young and it was devastating!! So nice you were able to visit and OMG this crepe cake. I have been wanting to make one forever! It looks just perfect! On my list to bake this weekend! Oh my crepe cakes always sounds so intimidating to make! But you make it sound easy. I hope I have the courage one day to face my fears and make this! hmm, simply damn delicious crepe!!! What an impressive, showstopping dessert! The photos showing all the slices have me swooning! Well done!!! This is over the top amazing! My best friend growing up moved away, too…summer reunions were so much fun! Love that this cake brings back those care-free childhood memories! This looks delicious, and especially with that infused maple syrup! YUM! Oh wow this is a whole lot of insane deliciousness going on right now! What a sweet story about you and your friend! I’m glad you took the plunge to make a crepe cake! It’s on my bucket list as well, and this sounds SO amazing! I love that food can bring back certain memories. Maple and pecan is one of my favourite flavour combos, so this sounds delicious to me. INFUSED MAPLE SYRUPS?! AHHH. Sounds so good. And i love that you used them in a crepe cake..this is a masterpiece! Holy Cow! These look too good!! Just hearing maple chocolate ganache make me hungry! Your repe cake looks amazing and probably tastes phenomenal ! We love your blog. Are you interested in becoming a Chicory recipe partner? Holy moly. Not only does this look STUNNING, but I can tell it tastes amazing. 🙂 I’m kind of obsessed with crepe cakes now, and can never turn down anything pecan, maple, or maple-pecan. Yum, yum!!! It was my first crepe cake and so much fun to make! I feel the same way, love anything maple-pecan! Thanks so much for your sweet comment and for stopping by!